A NEW Haw author who overcame breast cancer is hoping her new book will encourage more women to go for potentially life-saving mammograms. Avril Saunders, 63, was diagnosed with breast cancer in March last year following a routine mammogram. She said the quick diagnosis was the reason she could now look forward to spending many years spoiling her grandchildren. Her book, Mammograms Save Lives, dealing with what she went through, was published on Thursday (February 23). Q1. Can you tell us about yourself? I am a retired history teacher who taught history in a secondary school in Stockton-on-Tees for nineteen years. I am 50 years old and have had to take ill health retirement. I have an old dog, a young dog and two cats. Q2. What inspired you to write the book 'The Kipper Patrol'? My research into the Auxiliary Air Force, and my own personal interest in local history. To be honest, the book was a spin off from some research I had been doing for an MPhil research degree. As part of the research I had interviewed a great many veterans from auxiliary squadrons who did not really understand what an MPhil was, but who wanted me to write a book, so the idea for the book came from them really. Q3. You have written about a period in history that is about 60 years ago, how can you be so sure that the recollections are accurate? My book is written primarily about 608 Squadron. They were a part-time squadron of volunteers who gave up their weekends and one night a week to train to be pilots or ground crew. In order to make sure that the book was accurate, I interviewed about 33 members of the squadron who served in the 1930s and a similar number of veterans who served between 1946 and 1957. The book contains most of their recollections, as well as a potted history of the squadron. “The Blake Curse is all about heartrending choices, fast paced suspense and faith in the thread of human goodness” says author I. C. Camilleri. Book Reviews by John Davies*. "Valerie Astill's book is a marvellous account of a challenging three week holiday in Brazil, Peru and Bolivia. Her very readable writing style makes the culture, climate and landscapes of these countries come to life. Her descriptions are incredibly detailed and picturesque making it so easy to visualise the scenes that she describes. Indeed, I almost felt as though I was in the shower with her and the little green frogs! Valerie also gives a warts and all insight into the many difficulties of travel in these South American countries. I thoroughly enjoyed this delightful travelogue - well worth reading, even if you're not going on holiday to South America." *John Davies is an author, song writer and poet. He is also an athlete and has been the Welsh Masters javelin champion in his age group nearly every year since 1989. He is the Treasurer of Port Talbot Harriers and President of Welsh Masters Athletics. John Davies is the author of 'Lyrics and Limericks' and 'Chester to Chepstow'. 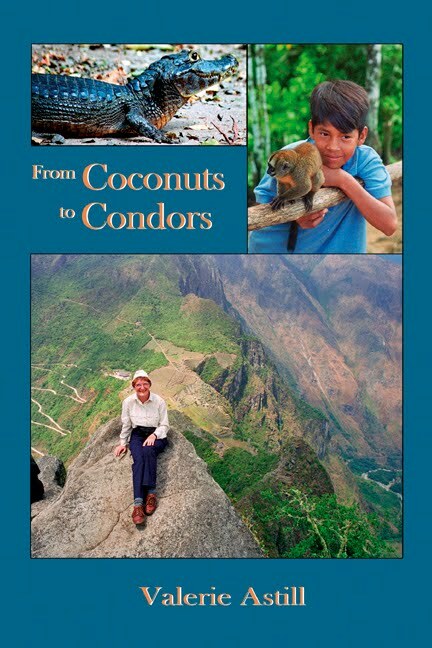 Valerie Astill is the author of 'From Coconuts to Condors' and has also written a second book titled - 'Temples and Tacos' about her journey through Mexico, Guatemala and Belize. Author Neal James* was interviewed by Barbara Conelli, Blog Talk Radio in New York on Sunday, 5th February 2012. BlogTalkRadio operates out of New York and hosts live talk radio show online. *Neal James is the author of four books: 'A Ticket to Tewkesbury', 'Short Stories - Volume One', 'Two Little Dicky Birds' and 'Threads of Deceit'. "This is a list of what featured most often from a number of bestselling thrillers reviewed as research from my bookshelf. The principles hold true for any genre although the details change for each." A book trailer for Read and Soar has been released. Read and Soar is a book about the many benefits and joys of reading. Where will your reading adventure take you? Between the covers of a book exists a sort of paradise. Books have a certain kind of enchantment about them; they are able to catapult you to a different world in the twinkling of an eye. By reading you can rub minds with the best thinkers of all time & share in the wisdom of the greatest minds. Neal James* was on Erewash Sound with Tris Walker and Laura Smith on Saturday 21 January 2012 to record the first of what may become a series of his short stories. Listen to an audio file of the transmitted short story titled - ‘Marks on the Wall’. Neal James would be returning to the Erewash Sound studios soon for an interview with Tris Walker – If you have something you want to ask Neal James about his work then please use the comment box on the 'Erewash and beyond' website or email tris.walker@erewashsound.com. Erewash Sound was launched in late 2004. Broadcasting on 96.8FM, Erewash Sound serves the Erewash Valley area of Derbyshire. 'Spring Leaf Books' unveils a new website, SpringLeafBooks.com and an email marketing brand – ‘Book Springs’, specially designed for book lovers all over the world. The new website is aimed at informing readers about tailored offers, reviews and interviews about their favourite books and authors. Book Springs is a newsletter of Spring Leaf Books used for targeted book marketing and promotions. All book marketing campaigns are based on clear goals, good research, appropriate use of social media and trends within the industry of book subject, to achieve maximum exposure. Springs Leaf Books is proud to be affiliated with PublishedBestsellers.com. Spring Leaf Books is a business unit of Pneuma Springs Publishing, an independent publisher, providing established and budding authors with publishing expertise since 2003. OTOLI is a story of bullying, teenage issues and the supernatural. The central character, a victim of bullying, Alice Turner, finds solace in a strange café called OTOLI and finds friendship with the enigmatic waitress, Jenny. It however turned out that Alice’s new friendship is not quite what it seems. Bryony Allen writes Adult and Young Adult fiction. She is the author of 'Mystery, Deceit and a School Inspector' and 'OTOLI', her latest book. Bryony is a teacher and currently lives in the beautiful wilds of the Suffolk countryside with her husband, four children, and pets, cats and dogs. Read the recent YA Book Reads blog with author, Bryony Allen. A NEW book charting a 70-year old runner’s mental and physical journey through life, as he sets himself almost impossible challenges, is out this month. Me and My Shadow is the story of Ray Matthews, a local man described by publishers Pneuma Springs as “truly exceptional”. Set in the life and times of Regency England, a stirring tale of love, dark secrets, manipulation and the determined human spirit. ...An inspiring tale of love, hate and the indomitable human spirit. A heart-tugging bitter-sweet love story, in which love, devotion and determination brings good out of the most tragic life circumstances. A romantic action packed mystery thriller fiction set in Glasgow inner city and the Swiss Alps.